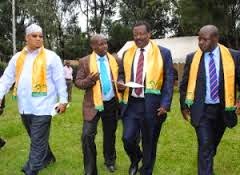 Kericho county UDF supporters are now demanding the immediate and unconditional resignation of Osman Hassan from the post of nominated MP for being disrespectful to the party leader Musalia Mudavadi. At the same time, party secretary general Abraham Limo has come to the defence of Hassan and threatened to kick Mudavadi out of the party. Party supporters led by branch chairman Jacob Ng’etich backed the dismissal of Hassan as the national UDF chairman claiming that he was creating disunity amongst members. UDF was founded in 2012 by members of Kenya’s 10th parliament. Mudavadi moved from ODM led to UDF but announced that he would remain as a deputy prime minister and member of parliament for Sabatia constituency. He said that he chose UDF as the party’s manifesto was in tandem with his aspirations and those of many Kenyans. “I, Musalia Mudavadi wish to announce that I will be offering myself as a candidate for the office of president of the republic of Kenya on the ticket of the United Democratic Forum party at the next elections,” he said amid cheers from supporters. “Even as I applied myself to the challenges of making a new home, I have deeply reflected on the positions I hold in the party and in government on behalf of Kenyans. I have resolved to resign as the ODM deputy party leader and as the minister for Local Government,” he added. Ng’etich who was flanked by women leader Florence Koskei, Weldon Kiprotich (secretary), Paul Byegonb (organising secretary) among other officials said that Hassan’s removal is in accordance with the constitution and Registrar of Political Parties Act. Koskei claimed that Hassan had become an impediment to the party’s manifesto as he lacked goodwill from members and the general public where he was expected to fish. UDF also announced that it would start the legal procedure to recall Hassan as nominated MP from Wednesday this week. Kassim Sawa was named the new chairman, taking over from Hassan in a list that retained Mudavadi as party leader with Jeremiah Kioni as his deputy. Former Shinyalu MP Justus Kizito was named secretary-general, taking over from Dan Ameyo who resigned after being appointed the chairman of Mumias Sugar. But the secretary general Limo who is Hassan’s ally, dismissed UDF’s NEC resolutions, saying Mudavadi’s allies would be humbled by the law. “It is us who invited Mudavadi to this party. He did not invite us. All Kenyans know this. He can play games out there, but we will not allow him to institutionalise sycophancy in UDF. We will be kicking him out soon,” Limo said. He said resolutions arrived at during the meeting that decided to remove Hassan had no grounds. Although Limo was retained as the chairman of the national elections board, he said he is not interested in the position, and declared he was still the secretary general.